I hope you will join me for a short series: Irrational (but Understandable) Homeschool Fears. Part I is today and Part II will publish in one week. I can write about this topic because I have BEEN THERE. You see, I was that mom who seriously considered homeschooling on several occasions. I was that mom who just KNEW education could be SO MUCH MORE. I was the mom who "afterschooled" each day my daughter was in public school. I am, also, ashamed to admit I was the mom who (through ignorance and fear) criticized homeschooling families. I one time said these exact words out loud to a friend: "She homeschools her children because she is scared to death of what she will do with herself when they are school age." What an ignorant, hurtful thing to say. In the past few weeks this subject of homeschool fears has been laid on my heart each and every day. Perhaps it is because I have a dear friend whose child is struggling in a new public school situation. I can hear it in her voice when I talk to her that she wants to make a change and she just doesn't quite know how. I try to listen and not "indoctrinate"... but I have offered to show her in detail what our homeschool day looks like. Maybe it was the mom who approached me at baseball practice last week. She asked me if she could sit with me and talk about homeschool. She had so many questions. She truly wants something BETTER for her bright and precocious first grade son. She has two children and said she has always thought about homeschooling. I see so much of myself in others who are "sitting on the homeschool fence". I have been there. I am praying daily for God to give me wisdom and graceful words to minister to these moms - and to be a homeschool ambassador. I thank GOD for the enlightnment He has bestowed upon my husband I... the enlightenment that gave us the courage to educate our children at home... the enlightenment that showed me my children's education should NOT BE LEFT TO OTHERS... the enlightenment that has helped us to NOT FOLLOW THE CROWD. After all, my children are growing exponentially, and I want to say that I made the most of every minute with them. I've been thinking about the FEARS I had about homeschooling, and if I acknowledge and write about them how it will help me to better minister to moms I meet who have those same fears. Will I Have Any Time For Myself? If I'm being honest.... no, you won't! But, you have to decide if you want time for yourself, or your children's hearts and minds. I will have years to shop, eat lunch with friends, decorate my home, go to the gym... all of those things I did when my children were in school that seem so trivial and meaningless now. And guess what? There comes a time when you can leave your children at home and go out for a breather every now and then. You can trade childcare with other moms, and you can always make your own quiet time at home. If you have had the "freedom" of having children in school full time it will be a hard adjustment, but the rewards of getting to know your children so much better and learn alongside of them trump any freedom I ever had. TRULY. My Child Will Be Lonely! The fear of your child not having friends is one I understand. My daughter mourned the loss of her "school friends" for the first six months of homeschool. After that, however, she learned that having just a few good and faithful friends was better than a whole gaggle of (oftentimes very mean) girls her own age. We came together as a family and are much closer today. Yes, your child may be "lonely" but you have to know that it will pass and the benefits will outweigh the short term difficulties. This season of loneliness built great character in my daughter and I am convinced that she will be better equipped later in life to deal with times when she might be alone. This one is tough, because we do all want to be accepted by others. The reality is, however, that when you decide to homeschool there will be some naysayers. Not to sound harsh, but OH WELL. As adults my husband and I forged ahead with our decision and set about the businesss of educating our children in the way we saw fit. Some family members were very supportive, others were skeptical. My friend base drastically shifted. Most of my friends now are other homeschooling moms. Yes, I do still have some of my old friends, but a few of them just couldn't grasp this lifestyle and we slowly drifted apart. The best decisions aren't always the most popular. Do what you know is right and have confidence in your decision. More to come on this is Part II. 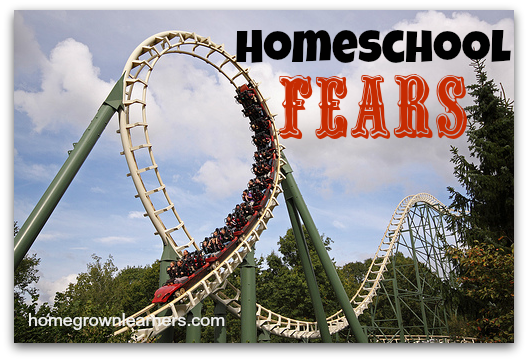 For now, what are your homeschooling fears? Tell me about your journey to homeschool.... Do you feel led to be a Homeschool Ambassador in your day to day life?